The concept of giving is very good news, because it means that anyone can be great in sales. The concept of giving is very good news, because it means that anyone can be great in sales. You might think to be great at sales you must have a great personality or understand closing tactics really well. These ideas miss the point. Because it’s not about you, it’s about them. You can define your job description in three words: I create value. 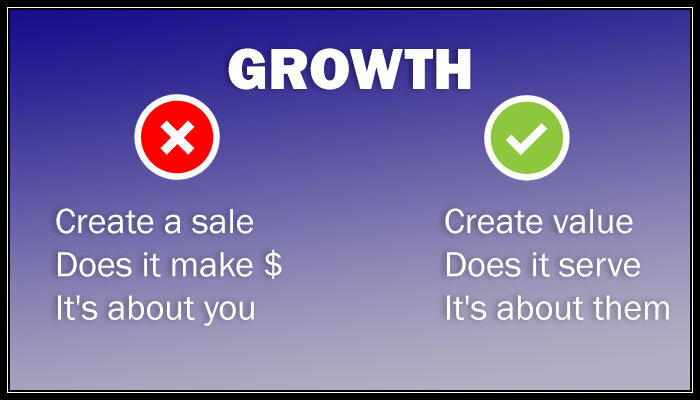 You don’t create value in order to create a sale or “in order to” anything. The idea is to create value, period. So we must willingly suspend our self interest and not act generously in order to create a strategic result. It’s to act generously period. The concept of giving is very good news, because it means that anyone can be great in sales. It’s a paradox. If you go about creating value for others with the ulterior motive of receiving more value yourself, it tends to show through on some level and sabotage the result. We are givers. We create value. Could you escalate your business growth – your revenue and business valuation? Could you consistently create predictable new warm/hot qualified 1st appointments? 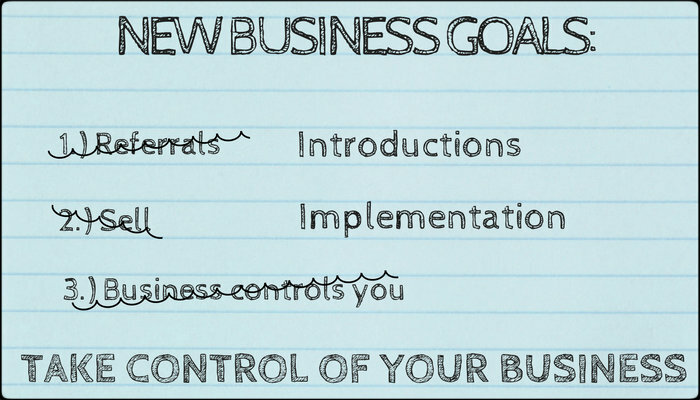 Could you gain control of your business? The simple and effective way to frame your business. Financial Advisors – Ever Wonder Why Creating Client Advocates Is So Ridiculously Difficult? It’s either because Advisors don’t understand the worldview of the market or they don’t address it effectively. However, some Financial Advisor’s behavior does show that there is at least a subconscious awareness of this issue. Case in point: I’m conducting a workshop with a couple dozen Financial Advisors. I begin the workshop by introducing myself and what I do for a living. I ask each of the participants to stand and introduce themselves as if I were a prospect. They proceed to describe themselves with some very “creative” names for what they do for a living. “I’m a Wealth Enhancement Specialist”. “I’m an Innovative Financial Solutions Provider”. If you could have been a fly on the wall you would have seen and heard each Advisor, one by one, introduce themselves to the group, not one calling themselves a Financial Advisor. By the end of the introductions we were all chuckling. When I asked why – and this took some thoughtful searching – they all agreed that it was due to consumer “attitude”, as they called it. This “attitude” is the worldview commonly shared by most consumers, a broad distrust of the industry at large. It’s not something you can change and we find that most Advisors don’t have a strategy to address and move beyond this barrier. The key is to develop your marketing story. When you truly understand the way clients and prospects think and feel, you can create a marketing story that subtly and effectively addresses this worldview. Creating this story will be different from anything you’ve ever done in the past. You’ll first need to erase that muscle memory that’s about selling and closing. Presenting facts and figures about your performance history doesn’t work. What does work is a passionate story that is about them, not about you. It’s the reason they will believe in you. When you do this you’ll find your most qualified clients and qualified prospects can become your best “client advocates”, the most productive centers of influence a Financial Advisor can have. It’s a service based business model. And while it might sound like a dramatic departure from the way you conduct your business, for most Advisors, it’s not. 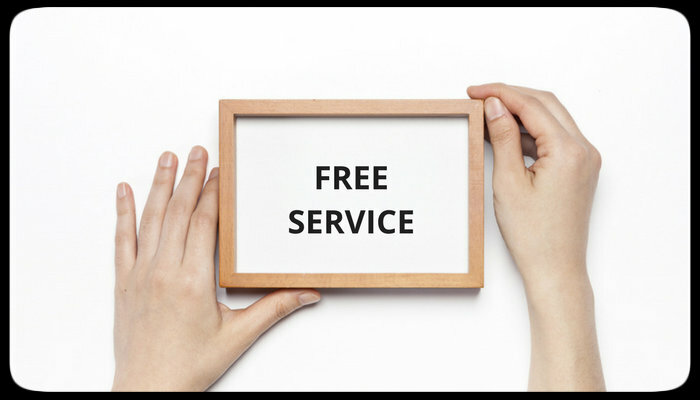 Your practice is based on “giving freely” and creating “client advocates”. You build business from the inside out and financial education and financial advocacy is your focus. Consistent qualified warm activity is your goal and it is easily attainable. Your business is built on a foundation of service, permission, reciprocity, and implementation – not selling. You are in control of the business. It’s an extremely effective business model that creates consistent warm qualified activity and grows business dramatically. 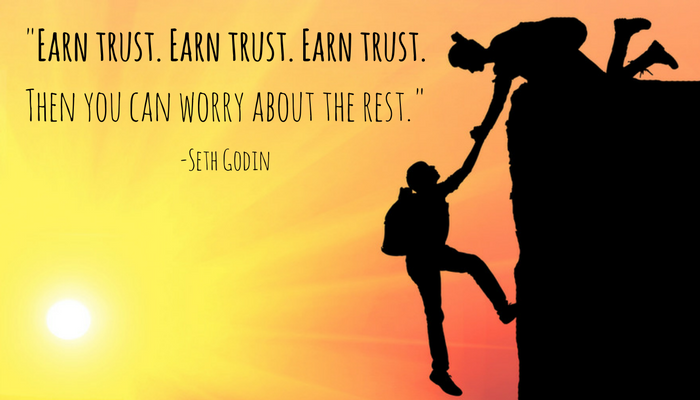 And it’s far from the typical sales model where closing the sale is the objective and asking for a referral is often an uncomfortable afterthought. Client advocates and warm qualified activity from the inside, out!